According to a Korean media outlet, Huawei is working on a strange smartphone design that could potentially mean the end of a notch era. But don't get too excited, because what follows might be even worse. The design features a display cutout for the camera, only this time it's smaller and surrounded by screen on all sides. Instead of placing the front-facing snapper on the notch, the engineers want to put it away from the top bezel so they can squeeze a bit more display on the front and get rid of the notch. This concept might introduce an entirely new problem. For example, how will the apps behave and how will the extra screen space be utilized? 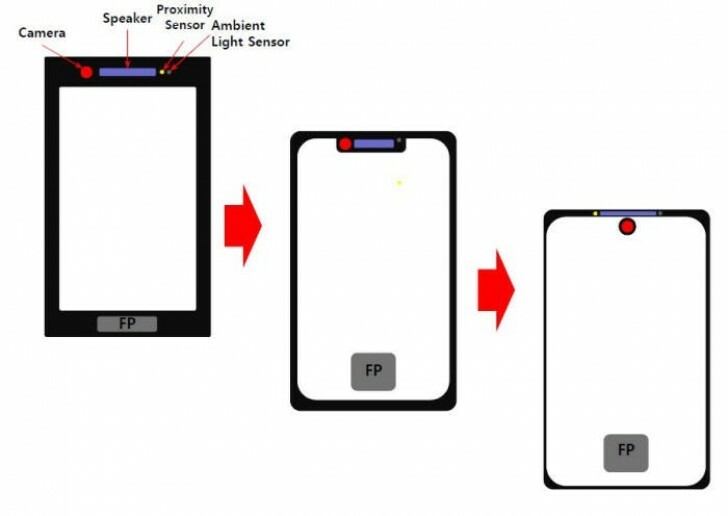 And still, the design pictured from ETNews shows a very slim upper bezel housing the earpiece, ambient sensor and the proximity sensor. To be honest, despite being a bit quirky, vivo and Oppo's design solution with their periscope-like camera on the NEX S and slide-out top on the Find X seem way more elegant. Also, we can't get over the notion that Huawei might be doing this for marketing purposes only - to brag about screen-to-body ratio. Then again, we'd be glad to be proven wrong and there to be an actual practical use case to this. Further the report mentions a 6.39-inch LCD and a possible launch in Q4 this year. This is in line with Huawei's leaked roadmap last year.